I’ve been making a lot of bagels lately. With tuna, with chicken and smoked salmon. Directly after our wonderful lunch at Las Chicas in Balaclava the other day, we headed straight for Woolworths and bought a bag of bagels. They were a good change from the usual loaf bread that we always have and they are tasty, fluffy and so versatile. You’d think after having just had so much bagel goodness we couldn’t walk and so many poached eggs that I’m sure I’d get heart disease at some stage that I’d give up on eating them for a while. Well, sorry to disappoint because I just can’t get enough of them. I was quite a sickly child when I was young. Up until the moment I stepped foot in Australia, I was constantly down with colds, fevers, headaches and had just about every bad habit a child could have. Coming to Australia not only changed my lifestyles and upbringing, it also changed my health to which I am so grateful for. During the days when I was sick, I would not eat anything. The dish I remember the most from my childhood was my aunt’s steamed eggs (this reminds me I must make this dish some day) which really put me off eggs for quite some time. I feel that my sickly childhood and lack of appetite for a prolonged period of time has caused the bounce back in appetite in recent years. I blame it on that. Yes, it has to be that. This of course also explains why I like eggs so much at the moment. 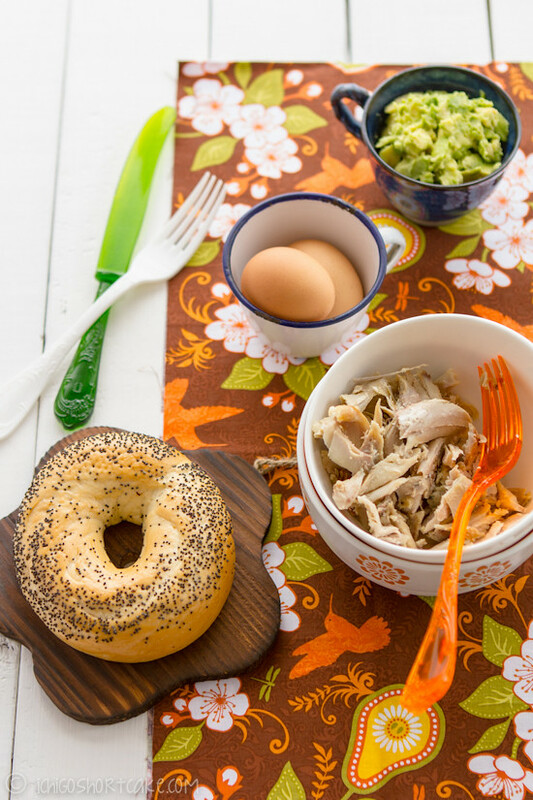 This recipe is very easy and fast to make, you just have to pre-purchase a roast chicken from the supermarket or roast chicken store and debone it. The chicken meat can be stored in an airtight bag or container and stored in the freezer for when you need to use it. 2. Cut the bagel in half (if it’s not pre-cut) and slightly oil the insides. Place cheese on top layer of bagel then toast all bagel pieces in the oven until slightly browned and cheese melted. 3. Use a large piece of cling wrap film and cover the inside of a small bowl. Crack an egg into the centre of the bowl and tie the top of the cling wrap after squeezing out the air. 6. Smash the avocado in a bowl and season with salt and pepper. Add squeeze of lemon juice and spread on the bagel. 7. Put on chicken, top with egg and salt and pepper to taste. 8. Serve immediately while still warm. I also added a few pieces of left over pancetta and that went perfectly well with the chicken, although it was added after I took the photos. Question time: Were you often sick when you were a child? Did your diet change considerably since then? This recipe has my name all over it! I would love this for dinner. 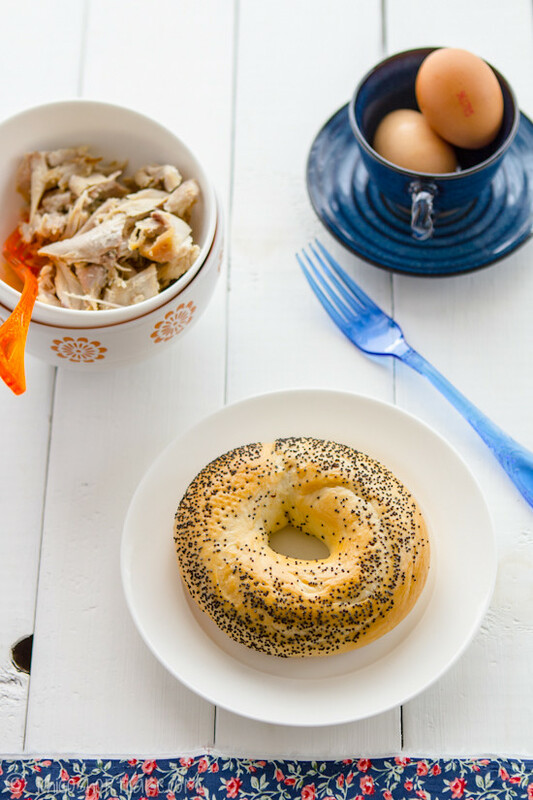 I have been eating lots of bagels lately….just plain with cream cheese….this looks like an awesome way to “dress” them up a little! Yum!! 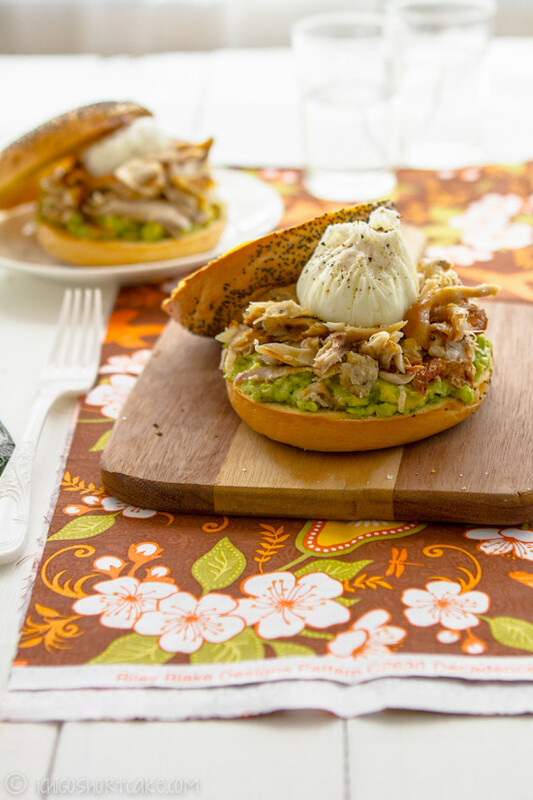 I love bagels any way and these look amazing! I can not wait to try them! You remined me that I was going to have a bagel for breakfast this morning and totally forgot, it is still in the freezer. That egg totally looks like a dumpling! I was always getting pnemonia and bronchitis as a child, sometimes both at once. I don’t think it has changed how I eat, though I still crave packet chicken noodle soup and oranges when I am sick as that is what mum would feed me. It sounds like you’ve had quite a childhood too, I wish I had chicken noodle soup when I was sick but all I had was steamed eggs! 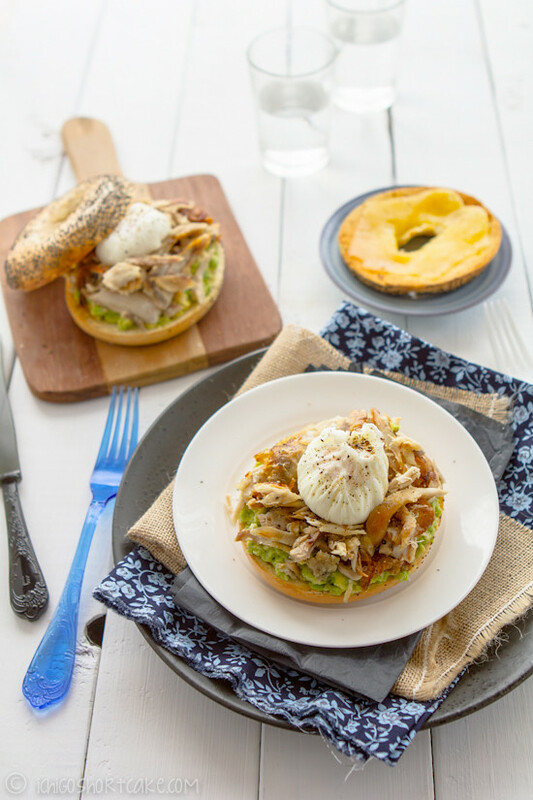 What an interesting way to poach eggs! I’ll have to try that some time. I usually just slip the egg into the simmering water. It always works, but sometimes the whites are a bit stringy. But I love the look your method gives the egg! And the whole dish sounds really tasty – good job. Thanks for your comment! 🙂 Poaching eggs this way makes the egg less watery and the water doesn’t get too messy. 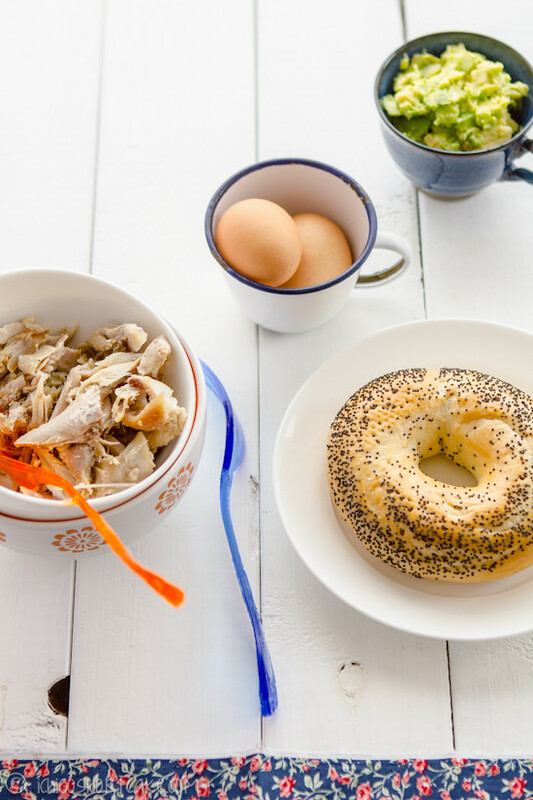 These bagels look great…I would be so very happy to eat this for lunch! Your eggs look fabulous! Thanks for the shoutout 😀 And isn’t that interesting about your health improving so much after you came to Australia-that’s great! Can’t go wrong with avocado and eggs 😀 Love the simplicity of the dish and also your food styling, looks very inviting :). I’ve been blessed with good health all my life, but maybe living in a good family environment has helped :). Ngaw you served it on a board – too cute! These look nice and simple and good! I havent had a good bagel in forever but now I’m definitely craving one! What delicious sandwiches! I love to use rotisserie chickens too. I’ll have to remember this recipe next time I pick one up. BTW, thanks for stopping by my blog. I”m glad to have found your site. I also love the name of your blog — very creative. Sounds like the perfect breakfast meal ! This look so good, and full of nutrients too:) I could eat this for any meal. this sounds like an awesome meal! definitely need to try this! Geoff LOOOVES bagels!! we went for the simple smoked trout and cream cheese for the packet of bagles we last bought. 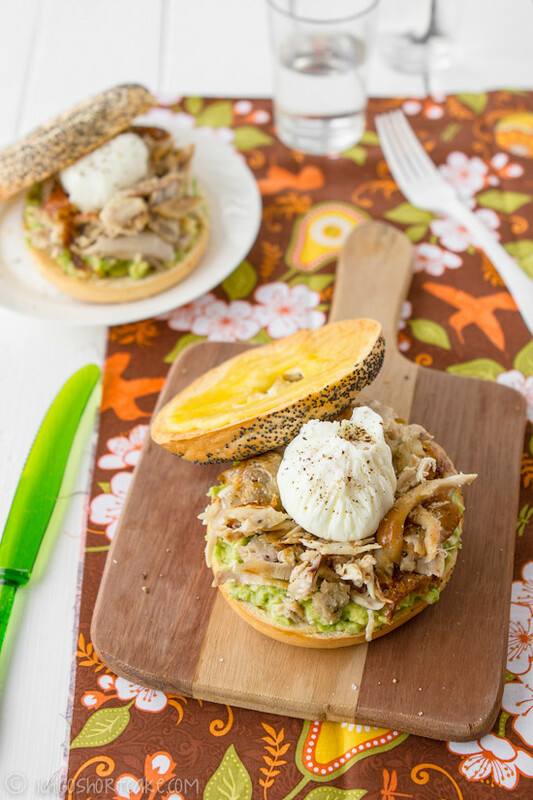 mm.. now that avos are cheap again (i think) its time for bagles again!